As you know, I've been on a bit of a zipper pouch-making kick. I've tried several different styles, and have been please with all of them. They have each, however, bedeviled me on one assembly point or another, and I can see the imperfections glaring in each one. So I have been working on trying conquering the bits that have made me dissatisfied. I'm pretty happy with this last one I made. This is the biggest one I've made yet. It started out 10.5" square. 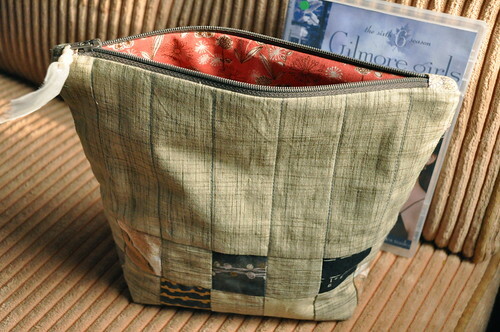 I used Moda cross-weave cotton on the exterior, with some various scraps for the patchwork around the bottom. Long-time readers may recognize this fabric as leftovers from Dunes. It has cotton batting on the inside and Dill Blossom cotton print for the lining, which you can just see in the photo below. 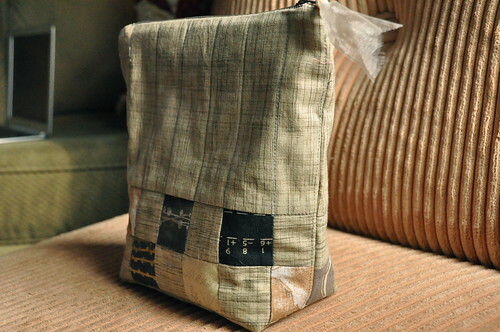 It stands up nicely - I gave it a relatively wide bottom to support it since it's so large for a zipper pouch. I think this is as big as you can make it unless you line it with something stiffer than batting. Any bigger and it would just flop over itself. Lindsay said I should show something to give an idea of scale. So I stood this DVD case up behind the pouch. And I'm especially pleased by the sharp corners. I found it very effective to use these tabs that cover the ends of the zipper and keep the raw edges of the zipper out of the seam allowance. That, and cutting the batting one inch smaller than the exterior fabric (I used a 1/2" seam allowance) are the two factors that I feel were most effective in getting the final product the way I wanted it. I also used a piece of ribbon for a zipper pull. Ugh, I can see a few loose threads I forgot to trim in this picture. It's always something! 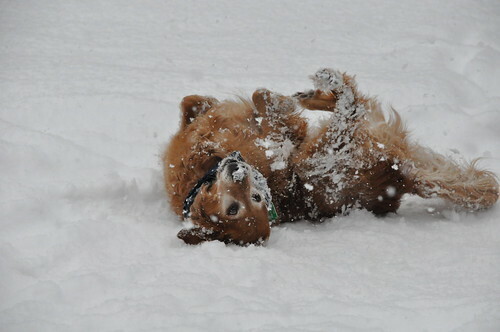 I'm happy. And now I think I'm going to rest on my pouch-making laurels for awhile. 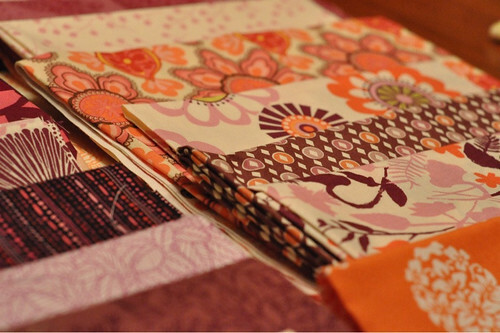 I have some other quilting that must get done! 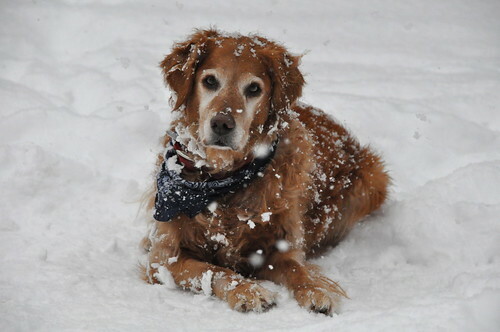 We are smack dab in the depth of winter now. It has been beyond cold recently, but the temperature has risen a bit just over the past few days. 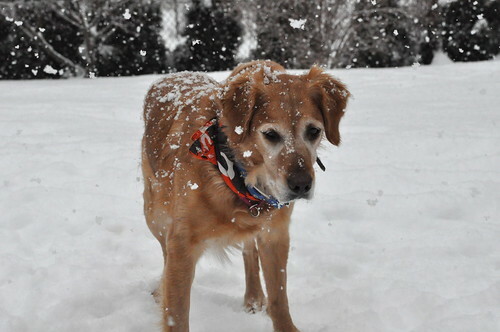 That means that when it snows you get those big fat flakes drifting down. 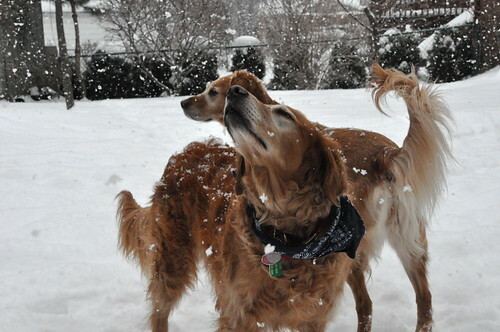 My dogs love the snow. 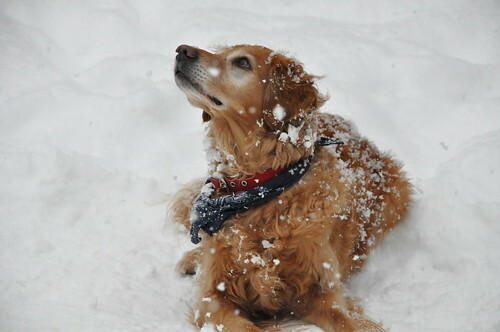 And a little video of Susie, singing along as an ambulance passes through the neighbourhood. I have still not completed all my blocks from the three bees I entered in 2010, and it is seriously oppressing my creative activities. I feel too guilty to throw myself into the new things I want to try in 2011 because I feel - and rightly so - that I need to honour my obligations to others before I indulge myself. So this past weekend I worked on clearing the decks. 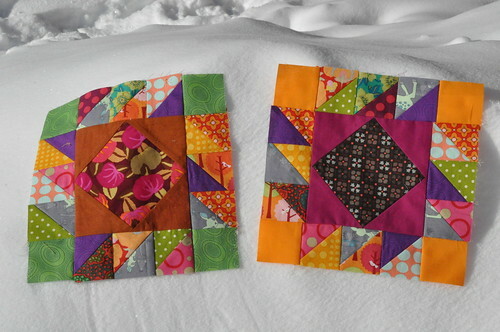 I made this block for Solidia, and with it, I finished my blocks for the Incredible Shrinking Quilters. Speaking of shrinking, I am down 17 lb, although with still quite a ways to go. 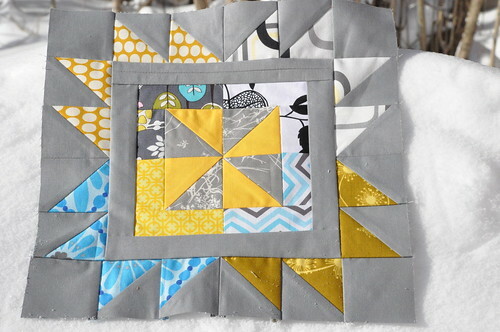 This block is made with HSTs - and I like the layout so much that I've decided this is what I'll use for that Maison de Garance HST quilt that I was puzzling over a few weeks ago. These blocks are for Rachel, in the Modern Tradition bee. 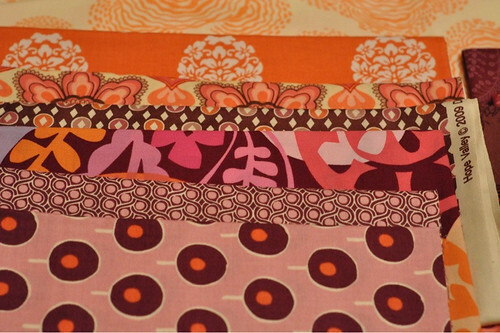 I love the saturated colours in these fabrics. They were so much fun to make. Now I have only one block outstanding in this bee - it is for Sandra and it requires the dreaded applique. I admit I've been putting Sandra's off because I'm scared I'll make a dog's breakfast out of it. This pretty thing is for Nicole in the Maple Leaf Bee. There's a poverty block in here - can you see it? Despite careful cutting, I didn't have enough of the gray solid. I must be the only quilter who doesn't have my own stash of gray, so I had to piece together scraps to make one leg of the inner border. This block was easy to make but so effective. I love her colour palette. 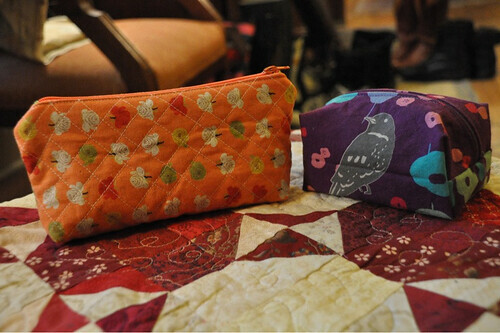 And then, because I felt that all that sewing or others deserved a small reward, I made a couple of zipper pouches. I am trying to perfect my technique on these cute little things, and they are like Lay's potato chips - no one can make just one. I really like them when they are quilted with batting instead of lined with interfacing, and I've been working on figuring out how the cut the batting so that it doesn't give too much bulk in the seam allowances. I'm pretty happy with that aspect of these pouches. This one is about 6" x 7", with a centre zip, made from Echino linen. I made this one to hold the precut diamonds for my hand-piecing project. It's the perfect size - I put the coloured pieces on one side of the zipper and the background pieces on the other side. Sure beats the sandwich bags I was using before. However, in my zeal to get this one finished, I sewed one of the linings on backwards. Since it is a pale aqua print, the right and wrong sides don't make a dramatic contrast. So I just left it, because I hate picking out around a zipper. But dang! I hate it when something so foolish happens. 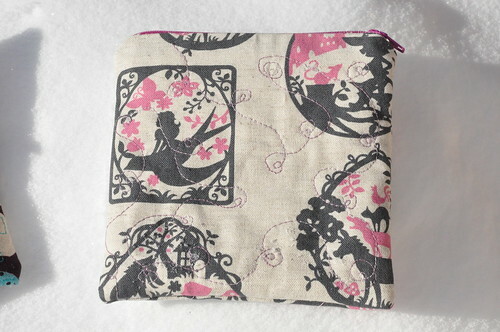 And this one is about 6" square, withe the zipper on the top. This linen has storybook scenes on it - Thumbelina, the musicians of Bremen, Red Riding Hood, etc. You can't see the lining, but it is a grey Lecien print. This one might be my favourite. 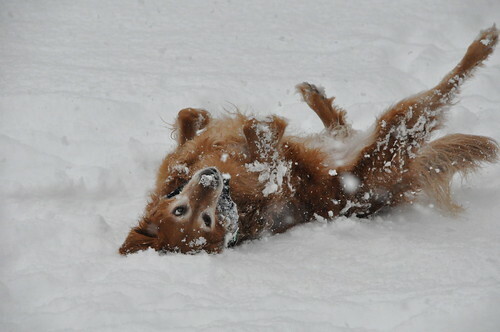 I can't stop petting it. In other news, after 12 years living in Kingston, I finally got a Costco membership. Thinking ahead to outfitting my daughter at university in the fall... Oh, and I also went on Twitter. So if that's your bag, you can add me using button in the sidebar. 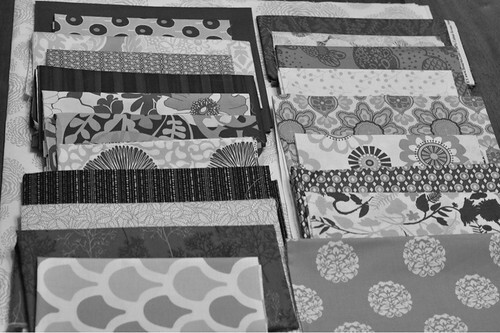 Thanks to Cheryl, the Naptime Quilter, for restarting Workshop in Progress. I very much enjoyed last year's Workshop posts, both in the receiving of feedback from other quilters and the giving suggestions and expressing opinions on others' works. In the absence of working together IRL, it's a great way to be able to help out, and to get opinions when you are nervous about committing yourself to a direction that you aren't entirely sure about. 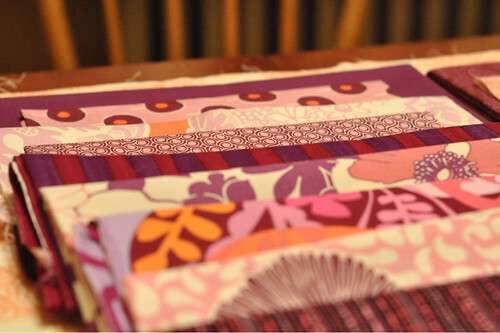 You may have seen the quilt in the photo above in the Fall Blogger's Quilt Festival lineup. It was one of my favourite quilts, made by Rebecca at Chasing Cottons. 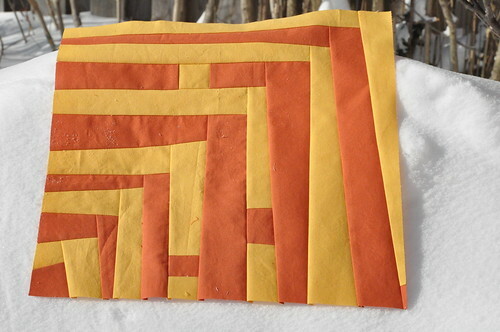 I bought the pattern as soon as I saw it, because curved piecing was on my quilting bucket list, and I figured I would damn well be an expert by the time I completed all the curves in this pattern. Well, friends, the time has come. 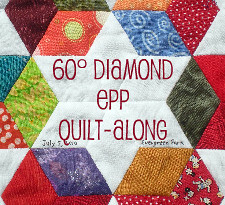 The pattern calls for 20 FQs. 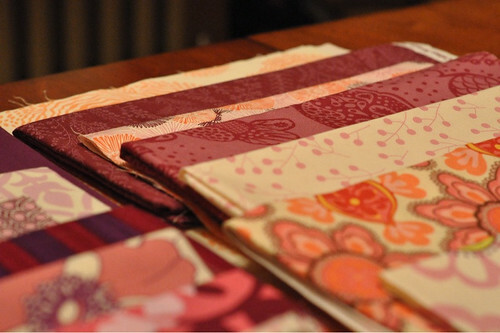 I bought a set of eight FQs from Liz Scott's Sugar Pop line. 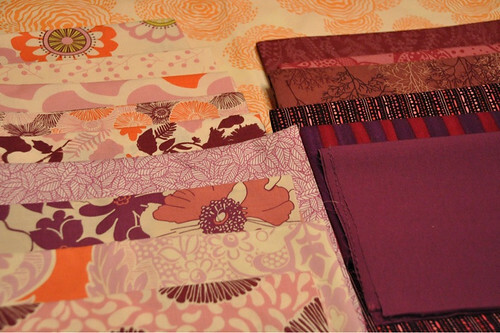 Jennifer and I had been talking about how nice orange and purple could look together, and when I saw this set I knew the time was right to jump in. This set has purple, orange and pink. 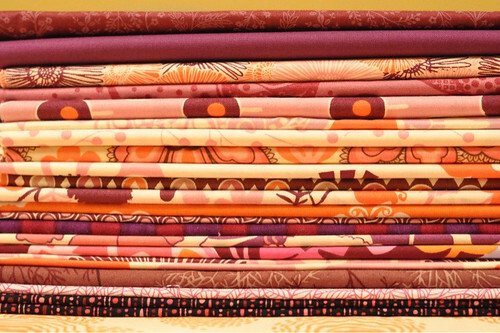 I went to my stash to find more fabric to add to make up the required amount of fabric, and here's where I need your help. I pulled more pinks, magentas, purples and oranges, but I want to make sure that I have a good range of values. I think having a range of lights through darks is really important when the colours are as close together as these are. So, what do you think? 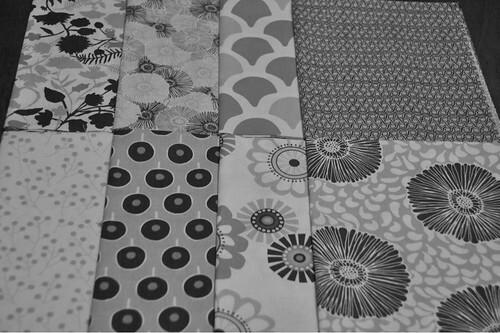 The Sugar Pops themselves don't have a huge range of values, so I was particularly looking for darker fabrics. Here's the whole range. There are 21 different fabrics here, so one would be eliminated. 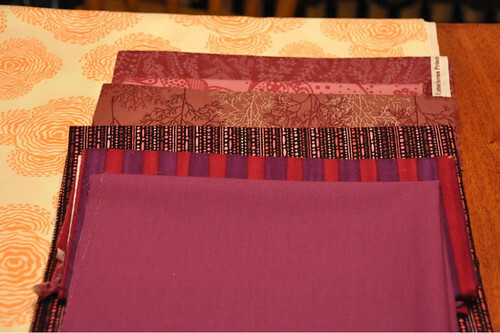 So what do you think - do these fabrics play nicely together? 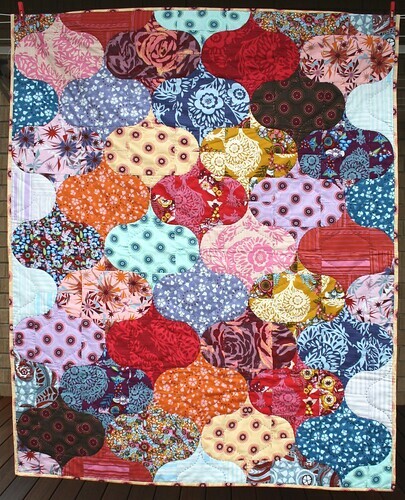 Do you think I have enough different values to avoid having this quilt look too same-y? If not, what direction should I go in? 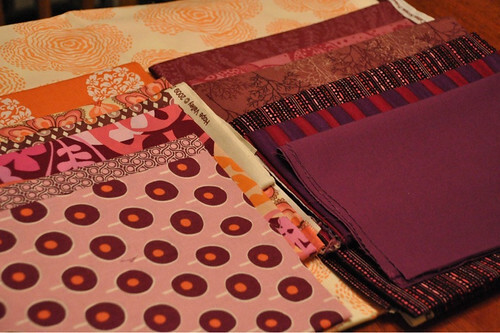 Do you feel like there is too much purple, orange or pink? Sing out! Happy New Year! Old Man 2010 has been carried off feet first and Happy Baby 2011 is filled with the optimism and ebullience of youth. We can none of us see the future, which is for the best, but we can hope for a year filled with joy, love and friendship, good health, and mental stimulation. And, while we're at it, let's hope for a little prosperity as a garnish! This year, please G-d, will be a year I mark two momentous milestones: my silver wedding anniversary and my daughter leaving the nest. 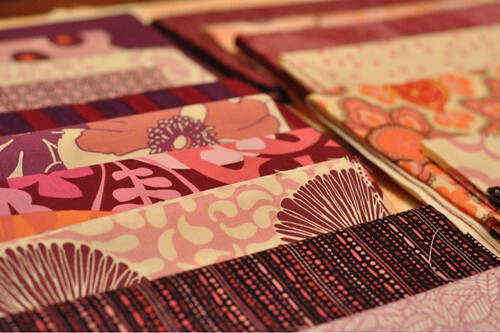 AND, if I have my way, I will also make many quilts and sewn goods! 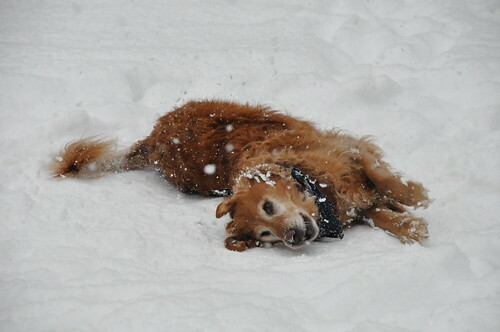 Welcome, 2011! I've had some time off, since the university closes down for the winter break. I brought a stack of work home with me, but have done very, very little of it, I'm ashamed to say. 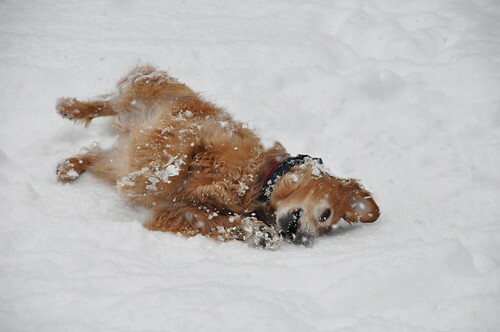 All that indolence ends in a matter of hours, alas. Monday is our statutory holiday for New Year's Day, so I have two more days before I have to report to the salt mine, but I simply must make some headway on the pile of work I brought home and dumped in the closet. 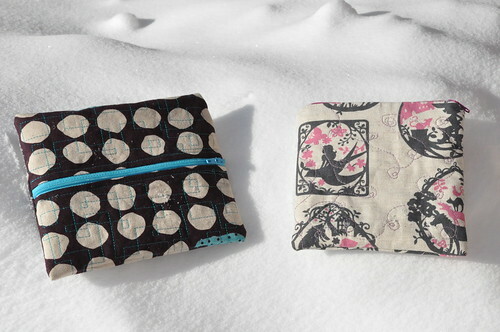 Yesterday I made two little pouches that have been on my list for awhile. I wanted to practice putting zippers in, since I haven't used a zipper foot since I was sixteen and made my prom dress. 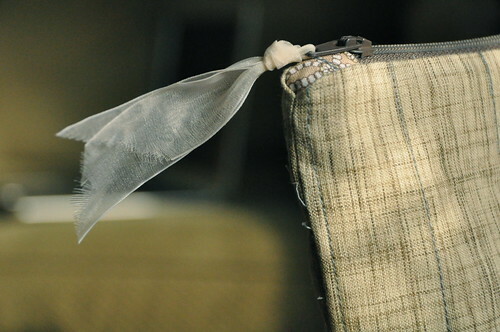 The pouch in this photo comes from this tutorial. It is about 5" x 9", and is lined with cotton batting. The exterior fabric is Heather Ross FFA2 linen/cotton blend. 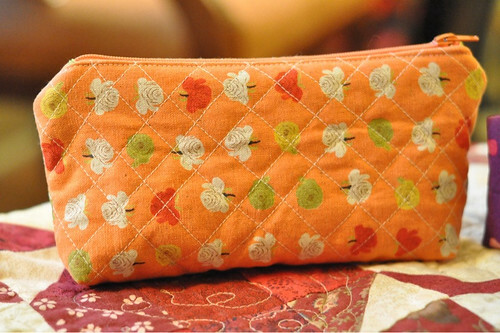 Because the exterior fabric was thicker than regular quilting cotton and the cotton batting adds another degree of thickness, the corners on the top of the pouch aren't sharp. 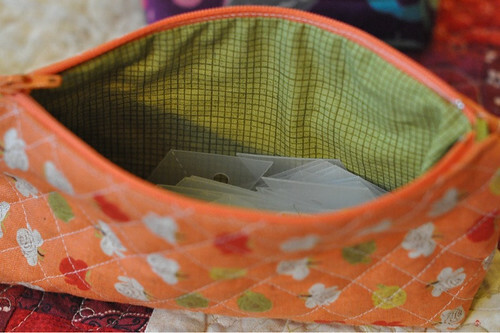 I'm using this pouch to store my Quilt Patis diamond templates, and in this photo you can see the green cotton lining. There are no raw edges inside, which keeps it all very neat. If I were to make this again, I would cut the cotton batting smaller and make sure it is not included in the seam allowance to avoid the bulk. 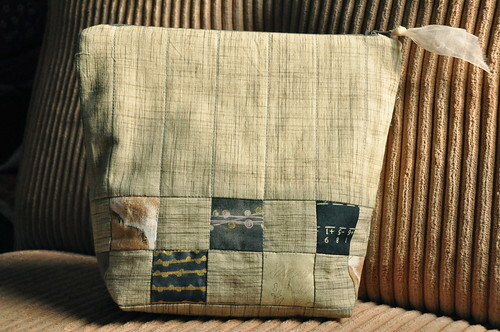 Since it is quilted onto the linen, it doesn't need to be caught in the seam allowance to keep it from shifting. 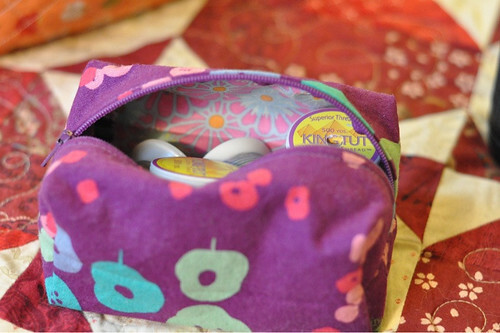 I followed this tutorial to make the purple pouch. 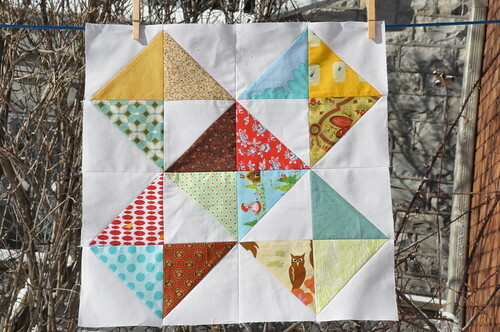 I used scrap Echino linen from the Love Birds quilt I made back in August. 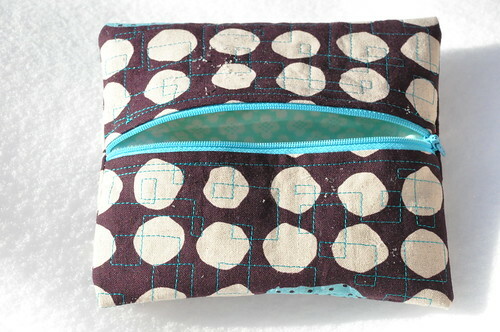 This one is lined with non-fusible interfacing to give shape to the box pouch, and lined with a Kaffe Fasset print. 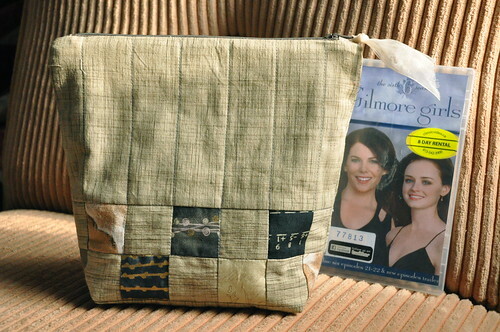 This pouch was very, very quick to make, but, although it is lined, the seams are exposed on the inside of the pouch. I used pinking shears to eliminate raveling, but it is not as neat and tidy as the orange pouch. 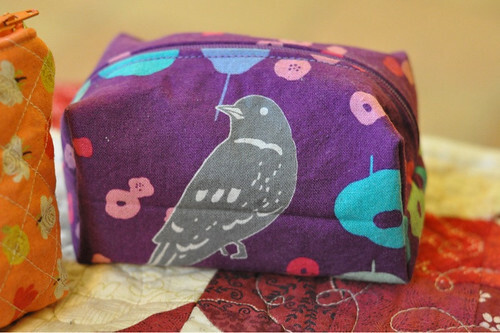 It makes for a handy place to store the thread I am using to sew up my EPP diamonds. Surprisingly (to me), these were a big hit with my husband and daughter. They both said, independently, "Wow, it looks like these came from a store!" 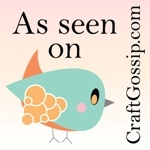 Which, of course, is the most back-handed compliment one can give to a crafter, no? However, the right spirit was behind the words; my daughter then asked if I would teach her how to make them, so that she could give them to her friends, in the "university care packages" they are all making to give each other for next year, when they have all gone their separate ways. But of course I will!